It's the last day of winter so I figured I would celebrate by posting a project! Here is a torn fabric wreath. Bent hanger into a circle, tore lots and lots of strips of three coordinating fabrics. Tied them tight and close to each strip so it would be fluffy. I tied somewhat randomly. It is hanging on the wall. These are fun to make and you can be watching tv or listening to music and able to make this kind of thing easily. Thanks for looking! I am working on other projects that I will share soon! It's a damp day out today, not overly cold....but a good day to keep on crafting and getting projects done. This is another memorial canvas that I made for a nice woman. We had connected a little while back when she was looking for someone to do some calligraphy for her. That went well and we became Facebook friends, I would enjoy it if we became 'real' friends too. She saw that I was making these canvases so we did a trade - her husband is a wood worker and I liked his work a lot. They gave me a cookbook holder and I completed a memorial canvas in exchange. It was a win-win for us. 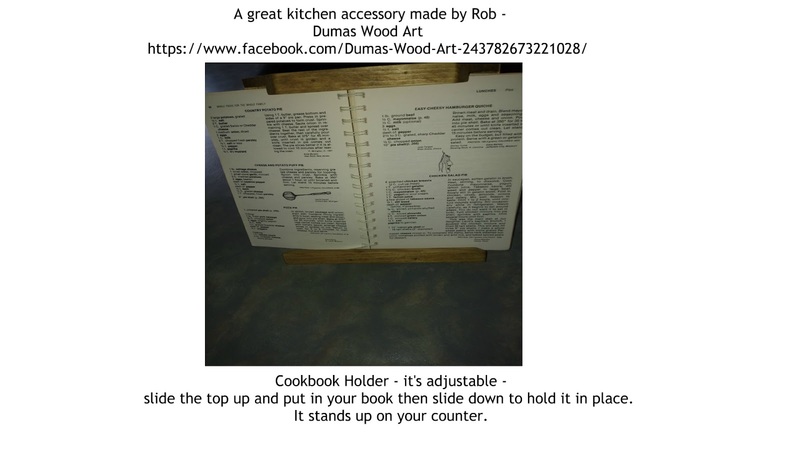 Here is a picture of the cookbook holder and the Facebook page so you can see other projects. And this is the memorial canvas that I completed. As with other ones, I do not publicly show the photograph on these canvases to respect the privacy of the family. 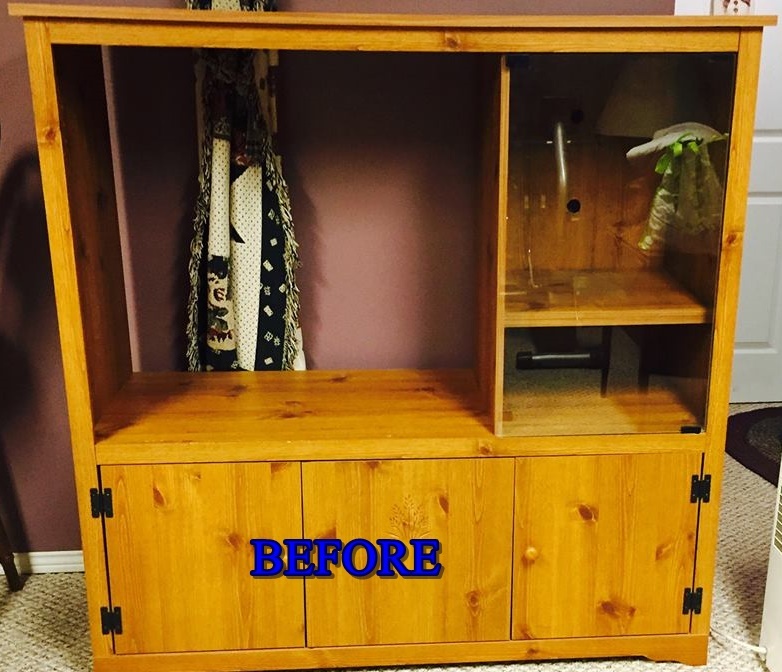 The photo is on the left side. This one is black and white - acrylic paint on canvas; spray varnish. It is still knitting weather to me so I continue to play around with stitch designs. Here are 3 little persons hats I knitted using circular needles. And one of the hats now sports a tassel. I have fun playing with designs. You can find me on Pinterest, I follow some great contributors and I would enjoy seeing what you have in your collection of pins! Thanks for looking, I will be back soon! Wedding season is now upon us! Below with the happy couple is the canvas keepsake I made especially for them! On top of that I used gray acrylic paint and lettered their names and wedding date. I sprayed varnish to protect it and there is a hanger on the back. Congratulations to this nice young couple! 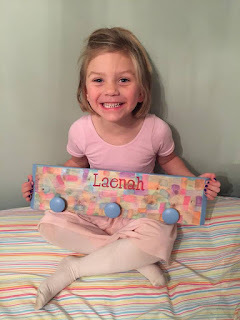 We've had some more snow days so it was the perfect time to get crafting! 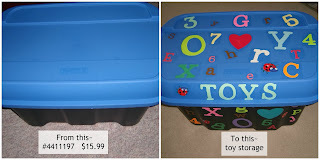 I bought a storage bin at my local Home Hardware store. I cut out letters and numbers from cardstock with my Cricut and some ladybugs (cut from wrapping paper) and I decoupaged them on using Americana Decoupage Medium. 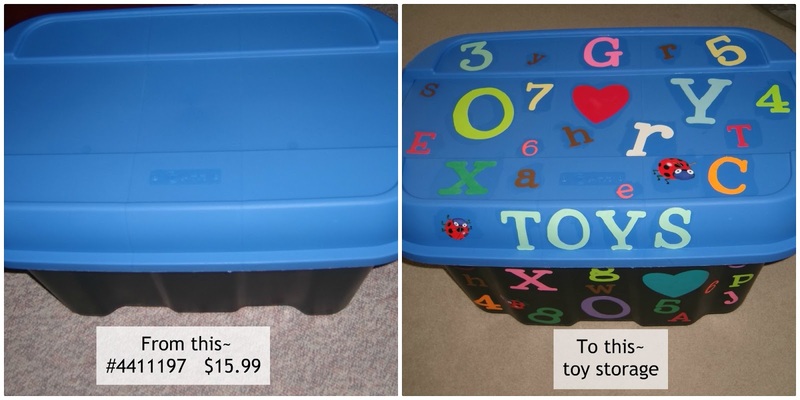 It is now a toy box. so bring on spring any time now! I've actually been accomplishing a lot of projects lately, here is my newest one for my friend's new grandson. It's wrapped canvas, I used acrylic paints, spray varnish and used jute rope for hanging. It seems like it is baby season! We sure have had some terribly cold days this week! So I stayed inside and did more knitting! This is a baby blanket, knit with double strands of yarn. The color is good for a boy or a girl and is nice and soft. It's a snowy day AGAIN so what better way to keep warm than to be knitting! Here is a baby blanket I just completed. It's made with double strands of Bernat yarn and size 17 needles. It knits up fairly quick and is sure to be toasty warm! Ok, now that I am psyched to keep this current I will show new projects as I finish them. This wrapped canvas sign was a joy to make. With wrapped canvas, I painted with brown acrylic paint as the background. Lettering in pink, yellow and white have the baby's information. I sprayed a top coat of varnish (now that was fun as it was so cold in the garage and outside so I sprayed fast, brought the canvas inside.) I attached some ribbon to hang the sign and then gave it as a present. 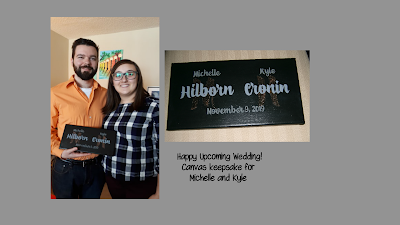 I will be starting another sign soon, a friend's first grandchild is due any day now so once I get the info I can start painting! Boy or girl? I lean towards the baby being a boy but hey, I have a 50/50 chance! You can follow my Pinterest Boards and I'd like to follow you back! These two photos are of a wooden sign I made. Using red for the background, made a plaid pattern with green and white paint. Lettered in white paint then using the sander I distressed the whole sign. Below are lots of various scarves, infinity scarves and cowls that I knit. 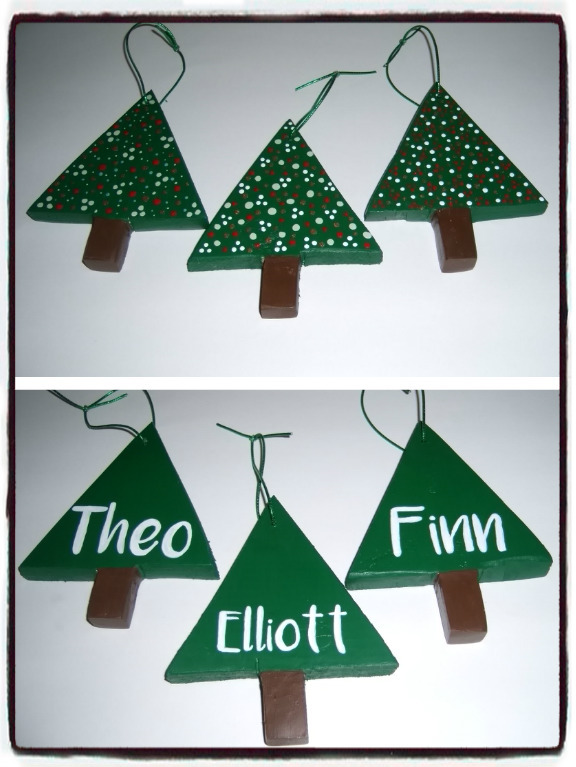 Front and back of Christmas ornament, personalized. I cut the spruce wood, drilled a hole and painted. Front and back of ornament. Cut the wood from spruce. Used pumice medium to give the tree texture. Painted green and added lots of colored dots on the tree. Lettered the back. Baby keepsake, wrapped canvas, acrylic paint, varnish. Wood shim project to fit into a frame that I had. Stained a lot of wood shims different colors. Heavy cardboard was the base on which I glued all the shims. My first attempt at shim work. Wood plaque. acrylic paints, teeth hanger on back for this new baby's sign. A 60th Birthday gift for a friend. Flat canvas board, water colors for map and acrylic paint for all other painting. Drilled holes to hang. Can you guess the state? Wedding -for the Dads and below one of the wrist corsages for the moms - stretchy bracelets and I attached ribbon, leaf and flower. Wedding party girls wooden hangers. Lettered and ribbon accent. Baby keepsake, wooden plaque. Stained wood, acrylic lettering, varnish. Sign - whitewashed, turquoise lettering, spray varnish. Little clothes rack. Cut spruce wood, painted with watercolors and acrylic paint. Wooden knobs. Varnish. 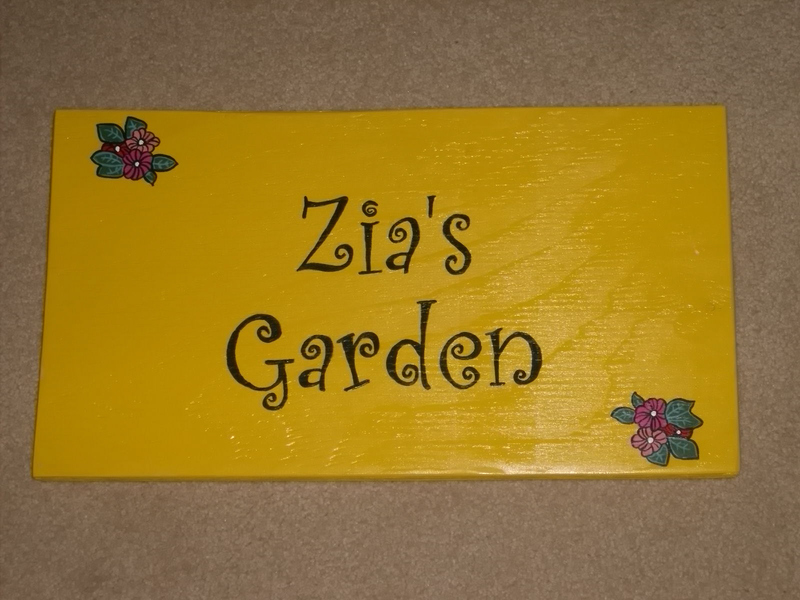 Cut wood, stained then lettered in acrylic paints. Watercolors and acrylic paint. Varnish, teeth hanger on back. New baby gift. Cardstock table numbers lettered in gold. These two signs are 16" x 20" canvas and were displayed on easels. Acrylic paint and artificial greenery. Cardstock sign lettered and trimmed in gold paint, used on a birdcage. Large canvas, acrylic paint. Hung above a cut piece of wood, painted and hooks attached for coats. 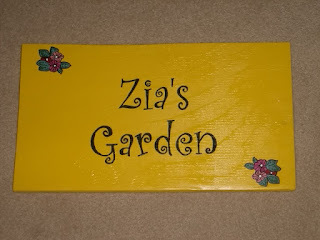 Zia's garden sign. Painted with acrylic paint, cut wood for plaque and also a stake. Outdoor varnish. 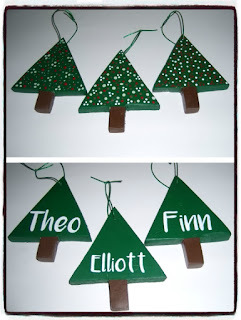 Cut wood trees out of spruce, painted and decorated and lettered on the back in acrylic paint. Varnished and put a green cord through the drilled hole to hang.